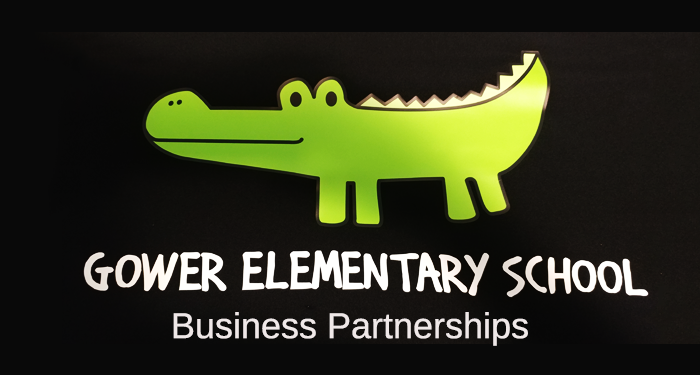 The Business Partnership Program is an initiative at Gower Elementary that encourages local businesses near Gower Elementary to support the school through financial contributions. In return for financial support, businesses are promoted and recognized as leaders in community in a variety of ways. In light of the staggering budget cut (over $100K) that Gower Elementa8ry sustained roughly 6 weeks into the 2017 – 2018 school year, the school administration, the PTO, and many students are depending on local businesses more than ever! T-shirts are an excellent way to advertise your business! Gower PTO purchases the following T-shirts each school year for every child (free to the every student). There are approximately 725 students at Gower this year. Your business logo will appear on the back of every t-shirt for the event you select! Title Logo – $1000; Large Logo $750; Medium Logo $500; Small Logo $250. Presenting Sponsorship includes large banner at event with sponsor logo, promotional booth at event, large logo on Field Day Shirts, 5 Gower T-Shirts, Social Media mentions as presenting sponsor, and all additional details previously mentioned above. Additional event details and description coming soon. Supporting Sponsorship includes medium logo on event banner, promotional booth at event, medium logo on Field Day T-Shirts, 2 Gower T-Shirts, Social Media mentions, and all additional details previously mentioned in the bullets above. Presenting Sponsorship includes large banner at event with sponsor logo, promotional booth at event, large logo on Field Day T-Shirts, 5 Gower T-Shirts, Social Media mentions as presenting sponsor, and all additional details previously mentioned above. Additional event details and description coming soon. The Gower Elementary School PTO is a 501(c)(3) nonprofit organization. Your contribution is tax deductible to the extent allowed by law. No goods or services were provided in exchange for your contribution. You will receive a receipt for your sponsoring gift to Gower Elementary PTO. ©2019 Gower Elementary School Parent Teacher Organization, Inc. The Gower PTO is a 501(c)(3) nonprofit organization. All contributions are tax-deductible.